Strat SSS Crusaders, your choice of colors! 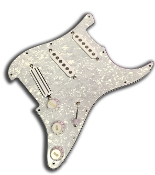 Prewired Strat Pickguard SSS Dragonfire Phat Single Duo Rail. Choice of color for your pickguard, 2 phat single pickups, 1 duo rail pickup, and knob set. 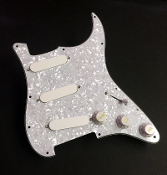 Prewired Strat Pickguard SSS, 3 Phat Single Coils Pro Series Pickguard DFBL, 3 DF-S's, QDD and BCU Pro Series Pickguard DFDG, DF-SA, EXP and BCU for Great Tones! Dragonfire DF-Ss with 7-way, pickup and pickguard color choices! 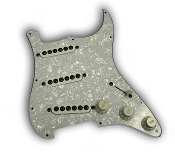 Dragonfire Vince Gill, pickup and pickguard color choices! Dragonfire Texas Blues Guard, pickup and pickguard color choices! Dragonfire Vintage Texas Blues, pickup and pickguard color choices!